John Elder Robison was a discussant for the Autism Social, Legal, and Ethical Research Special Interest Group at the 2014 International Meeting for Autism Research (IMFAR). He ended up taking the group to task, stating that the autism science community is headed for disaster if it does not change course on several factors – and noting for context the larger size of the US autistic community in proportion to other minority groups such as Jewish or Native American communities. Mr. Robison asserted that autistic people need to be the ones providing oversight and governance for autism research. He condemned the use of words like “cure.” He pointed out that researchers’ explicit or implicit efforts to eradicate autistic people is a formula for disaster and needs to stop. And he affirmed that memoirs and narratives written by autistic people are more trustworthy than writing about autism by nonautistics. Many thanks to IMFAR participant and community member Todd Melnick for transcribing this talk. One question she didn't mention -- and I think it’s important to begin with this -- is What’s the meaning of “1 in 68” [the current CDC estimate for autism prevalence]? I’ve served on the CDC and NIH committees to discuss the formulation of the research leading to such numbers, and how we derive them. I serve on the Interagency Autism Coordinating Committee (IACC) where we create the government’s strategic plan for autism. From the perspective of someone who saw how we got there, 1 in 68 tells me autistic people have always been a part of society, and are always going to be here. We are recognizing that the autistic population is bigger than anyone ever imagined. Let me put in perspective what “1 in 68” means. 1 in 68 and rising means that there are more autistic people than there are Jewish people in the United States. There are more than twice as many autistic people as there are Native American. Now let us consider autistic people as a group compared to Jewish people or Native Americans as a group. Who would you imagine would advocate for one of those groups? It would be a Native American or a Jewish person. Of course it would. We wouldn’t expect anything else. And yet we are still having a discussion about who should advocate for autistic people. What’s wrong with that picture? It’s something that really needs to change. The continuing use of words like “cure” in a discussion of autism is a slap in the face to everyone who celebrates the gifts autism has brought us. It’s more that just disability. Then there’s the continuing reality that lay people in the community believe that scientists want to do genetic research to eradicate autistic people. That may be the farthest thing from a researcher’s mind but the fact that the public believes it is a disaster for researchers. And the only way we’re going to avoid more such disasters is to bring autistic oversight and governance into research. That, to me, is a really important matter. We had a couple of questions raised in the [ethics] discussion. We asked who should make ethical decisions with respect to autistic people. And who should we trust for narratives about life with autism? We have narratives that are written by autistic people, and we have narratives written by observers of autistic people. But think about Jewish or Native American narratives. Who do you trust? Narratives written by outsiders? Or stories of Jewish life in a Jewish person’s own words? It should go without saying. And I heard someone stand up here and say, “the problem with narratives from autistic people is that those narratives are written by ‘high-functioning’ people.” And we can say something like that about every other group. There are rich Jewish people and poor Jewish people, there are rich Native Americans and poor Native Americans, there are smart ones and foolish ones. You can pick any trait that you wanted to talk about and you can say that the other is the one writing about it. That does not invalidate the narrative. When it comes to written narratives, from any group, we can always say this: they will be written by the more articulate members of that group. That does not detract one bit from their validity either. We see a range of narratives emerge over time; they will ultimately describe a broad swath of experience within our community. The fact that our community is recently recognized means we don’t have as many narratives as, say, Jewish people, but they are coming and they deserve to be respected. I believe that ultimately it’s our group, it’s our place to tell our stories, and it’s our right to determine our fate. And I think that applies in the legal arena, it applies in the medical arena, it applies in school; it applies everywhere. Anyone who questions that needs to really step back and think about that 1 in 68 number, because the 1 in 68 number says we’re not dealing with a small population that is ‘diseased,’ we’re dealing with a significant subgroup of humanity. And that subgroup isn’t going to be gotten rid of. If we were to suggest we should do medical research aimed at eliminating any other population subgroup, can you imagine the opprobrium that would follow? You would be run out of the room! And yet people still say that about autism. And I know it is easy to look at somebody like me and say, “well he’s a ‘high-functioning’ guy, and he doesn’t know what it’s like to be around people who can’t talk and can’t take care of themselves. How do you know I don’t know? I have cousins who can’t talk. I have cousins who can’t read and do things. And I’m well aware of what life is like for people like that. I’m also well aware of how autistic people transform as we get older. You look at me and you think that I’m articulate now. But in school people called me a “retard,” and they called me a “mental,” they called me all kinds of other things. Presumably I didn’t look as smart and articulate as I do now, if I was called those names, because it happened. And while I will not claim to have the experience of living the life of someone who can’t speak, neither can any of you who are parents of someone who can’t speak. I don't know that you are tremendously closer to it than I or anyone else. And by making that statement I’m not telling you that I’m better qualified, or know your son better. I guess neither of us knows what it is to be inside someone else’s head. I’m saying if we have to cast a vote, we have a duty as a society ... I think the overarching ethical duty is that the affected group is the one who has the absolute right to make the decision about itself. And then, the next group in line, would be the closest affected unit, which would be the parents. But the parents are not number one, the parents are number two. And we’ve lost sight of that in the autism community because autism was perceived to be a children’s problem and the advocacy movement was started by parents, and it represented the interests of parents. Now, we recognize that autism is a lifelong developmental difference. And its study should be guided by autistic adults. I didn’t actually come in here expecting to express such a strong point of view to you folks, but having heard these ethical questions, and having learned that one of the ethicists in today’s discussion was a grad student of my father’s, and having grown up with a dad who taught ethics and led the UMass Philosophy Department for 30+ years; and my father and me coming from a line of preachers and ethicists and lawyers, I thought, well, I should just come up here and say these things. And to say one final thing about this “cure” business: everyone who lives with autism experiences suffering. You look at me and I look articulate, but I suffer, in some way, every single day. You know, you look at somebody like me and you think, he looks, you know, so successful and so functional … but those of you who were in some of the adult outcome presentations here at IMFAR saw that anxiety affects forty per cent of us, depression affects forty per cent of us, several per cent of us kill ourselves. Those are absolutely very real risks every single day for me. So I, too, live with those things. And you know, if I knew a way to remediate that I would seize it in a second. And I think that the duty of scientists is to develop tools in this context to relieve and remediate discomfort and suffering. It is NOT to develop something that is called “a cure,” which has the ring of getting rid of us. And it’s really really important that scientists understand the use of that word, and the language. Because to so many people in the autistic community, “cure” equates to elimination. And I know that many of you scientists don’t mean that at all, I know many of you parents don’t mean that, I know when parents say “I want to cure my son’s autism,” what they’re really saying is: “I want to relieve what I see as my son’s suffering.” I believe that so I don’t feel anger at those parents. But there’s a lot of people who see this issue really, really differently than me. And they see it as a really black and white thing, and I think you’re venturing into a minefield when you continue to carry on the conversation like that. If we can focus on relieving suffering and maximizing capability, and when we open up a dialogue and recognize that autistic people stand with other significant recognized minorities in America, then we can begin to talk about changing society. And about changing society -- this goes back to my father the philosopher and his ancestors -- My father and I [are descended] from another philosopher and minister who founded the Anglican church in Bruton Parish, Virginia in 1678. One reason I’m at The College of William and Mary today is that his son was one of William and Mary’s first faculty, in 1699. And I believe those ancestors, of mine, were autistic. I look back at history (William and Mary is kind of the seat of the study of colonial history in America), and I see that autistic people at most levels were not disabled in colonial America. It’s easy to see how somebody like me, who grows up to be able to talk and work, would not be considered disabled by many today. But it’s also interesting to see that there are many narratives that describe other people today as intellectually disabled, and non-verbal autistic, or ‘severely’ autistic. We have all of these modern, technical words for those people. But in colonial America, they called those same people sheepherders, and they called them blacksmith’s assistants, they called them a lot of things, and all those names related to their jobs. Most of those people weren’t disabled in the context of their time. They are disabled today not entirely because of autism, they are disabled because they are different from the rest of the population, and society has changed in ways that exclude us. And that to me is a real tragedy. Today we have a neurodiversity initiative at William and Mary, which I’m proud to be part of. Back at my home in Massachusetts we have a school that I co-founded that teaches automotive trades to high school students on the spectrum. A really interesting thing came to me in working with the W&M students and operating our high school. It’s regarding what we teach and how some jobs are supposedly “better” than others because of the intellectual power needed to do them. I’ve come to see the societal wrongness of that notion, how it’s exclusionary, and yet it’s everywhere today. In contrast, in our TCS Auto Program, we teach the auto trade in the midst of a working automobile dealership complex. So our high school students are surrounded by a hundred guys doing everything they do at a dealership to fix and clean and deliver cars to their owners. When we get a student in there with an IQ of 60, and we get another with an IQ of 130, they are both equal. Because in a car dealership, the guy with the IQ of 60 might be a successful and popular detailer, and polish and wax the finest Rolls Royces. And he takes real pride in that, and every Rolls Royce owner comes in and gives him a tip because he made the car look so beautiful. John Robison at IMFAR's opening reception. 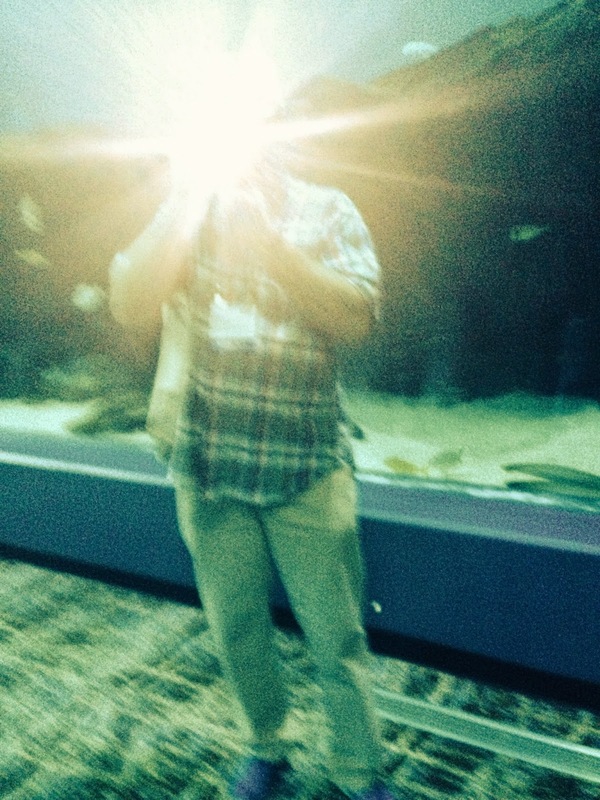 with his face obscured by his camera's flash. The kid with the IQ of 130, he does diagnostics under the dash and none of the customers even knows who he is, they just expect him to fix their cars. He doesn’t get recognized, but he’s important too because he solves tough problems. And the kids that are in the middle, they sit down and take apart transmissions and do other repairs. They are the heart of every dealership. The beauty of that is because they are part of a community -- not a school, where they’re segregated -- everyone has a place that’s equal. The guy who cleans cars is the guy who cleans cars. He’s not in the slow class, he’s not called stupid; he’s just the guy who details cars. And we’ve lost sight of that in our schools. So these changes might start with schools recognizing that classes aren’t for people who are “less” or “more,” they’re just for people. And if we structure classes like we structure work, we don’t put the people with one IQ in one class and in another, we put everyone together and let them be together, doing different jobs. That’s what happened in colonial America, that’s what can happen in some businesses in America today, and that’s really the key to bringing autistic people into society, bring society back to the model that accommodated us for thousands and thousands of years because the 1 in 68 today was 1 in 68 in 1900, and 1800, and 1700, and every century before that. So I’m out of time… probably not what you expected to hear, but those are my reactions to what I have heard. Thank you.